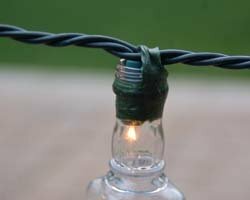 These patio party lights look festive hanging in your yard for summer evening barbecues, and they are surprisingly simple to make, once I share the secret with you! 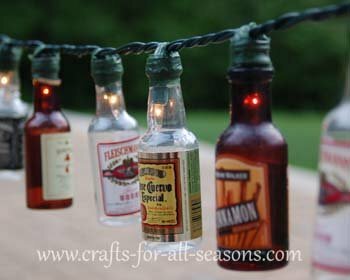 If you have a collection of small booze bottles, you can put this summer craft together in no time. 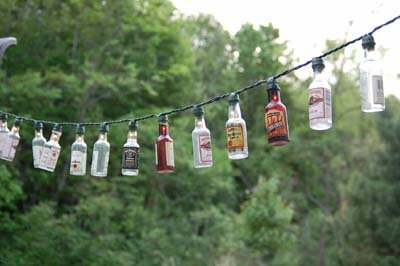 All you need is an assortment of booze bottles, a string of white lights, and some floral tape. Where do you get these little bottles? Ask friends to start saving them from airplane travel. Ask the flight attendant to save any empty bottles from the flight. You can also buy them at the state liquor store. 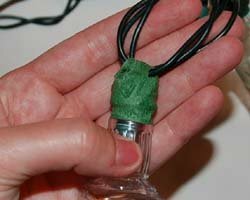 Read on to learn how to make these party lights, with these easy step by step directions. 1. 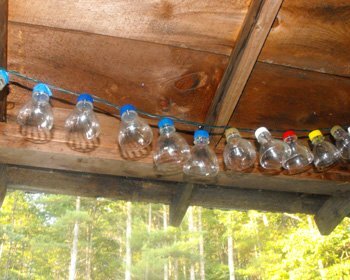 Begin by removing the top from each bottle and throwing it away. 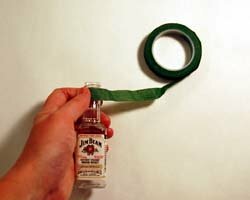 Next, begin wrapping floral tape around the mouth of the bottle several times. Floral tape sticks upon itself so wrap it tightly. 2. After a few times around, place a light into the mouth of the bottle. 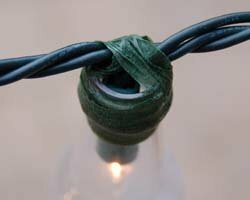 Have the floral tape go up and over the wire to the other side, creating a little loop. 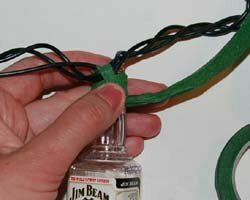 Go around this a few times to make it more strong, and end by wrapping the floral tape around the mouth of the bottle a few more times to secure. Use the photos below for reference. 3. Continue adding on a booze bottle on to each light. Enjoy those party lights! 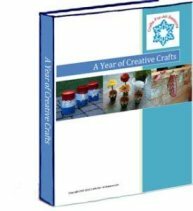 One of my readers, Leona, came up with a wonderful and unique variation of this craft that I would like to share with you. She cut off the top parts of water and pop bottles, and drilled a hole through the top of each cap for the light to be pushed through. Thank you Leona for the photo and the idea!